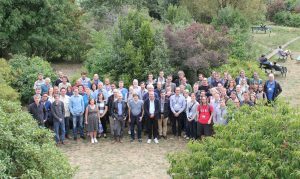 The 4MOST All Hands Meeting 2017 took place in Lyon on 11 – 15 September 2017. The meeting was hosted by the 4MOST team from the Centre de Recherche Astrophysique de Lyon (CRAL) and took place at the Ecole Normale Supérieure de Lyon (ENS-L). This third annual ‘All Hands Meeting’ of the 4MOST consortium brought together consortium members working to define, construct, operate and scientifically exploit the 4MOST Facility. This included the scientists from the large number of institutes involved in defining the ground-breaking consortium science surveys, the applications specialists involved in the infrastructure groups, and the engineers, managers and scientists responsible for the delivery of the 4MOST Facility. We also heard more general talks about the Euclid mission (by Yannick Mellier) and the MUSE instrument (by Roland Bacon). Among the highlights of the meeting were the approval by the 4MOST Executive Board to proceed with the full complement of one high- and two low-resolution spectrographs in response to increased funding levels. Furthermore, all 4MOST executive and advisory bodies endorsed a reorganisation of the management structure, bringing all of the data flow and operations development efforts under one umbrella of the new Operations Development Group (ODG) under leadership of Jakob Walcher as Operations Manager (OM). Finally, many details of the assembly, integration, test, and verification at both the AIP and Paranal locations were worked out, and interfaces between subsystems were clarified and refined, while the Surveys worked on their schedule for the Consortium Survey Plan. In addition to discussing ideas on the development of the 4MOST instrument and science, participants also got to visit Lyon. The city is famous for its beautiful city centre, its culture, and is well-renowned for its gastronomy, in particular the typical restaurants serving Lyonnaise cuisine (“bouchons”) in the old town.